Welcome to our monthly Sewing 101 feature. 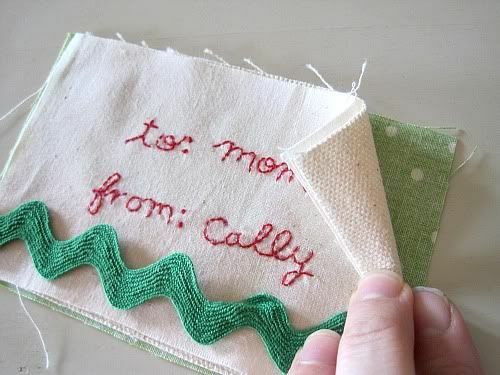 Today's bit of wonderful comes from Cally of Calico. I found Cally's blog through One Pretty Thing when Rachel featured her incredible Quiet Book. I've been a devoted fan ever since. 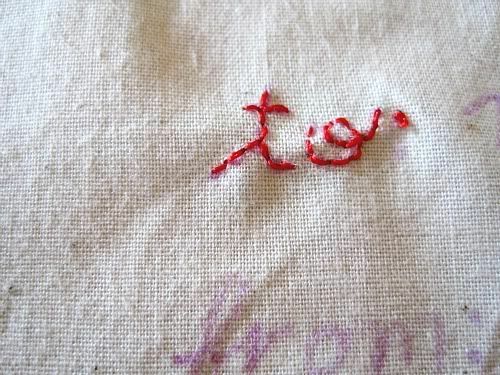 She uses embroidery in many of her projects. 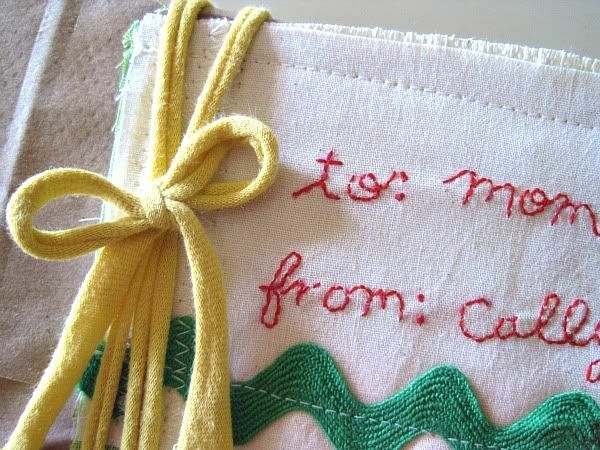 In her tutorial, she shows us how to make embroidered gift tags. I love simple gifts with personality. 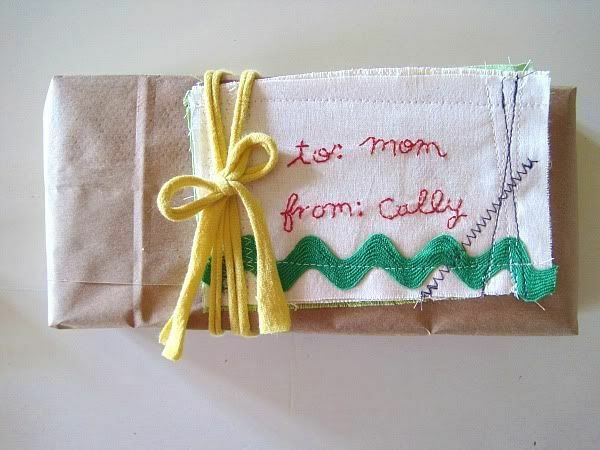 Give me a box of mac and cheese with some fantastic handmade wrapping, and it's my favorite. 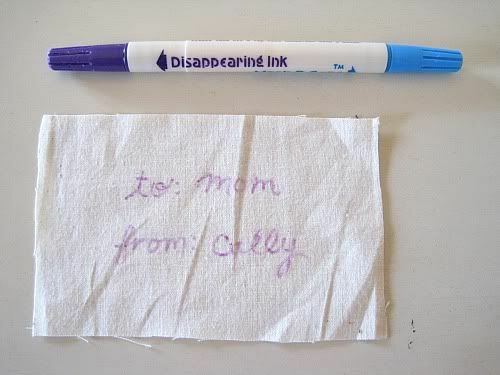 Write your message clearly on your muslin (or whatever cotton fabric you choose) with a disappearing ink pen. You can find these at any craft store in the notions section. Now bring your needle up at one end of your first letter. Don't pull your needle all the way through! 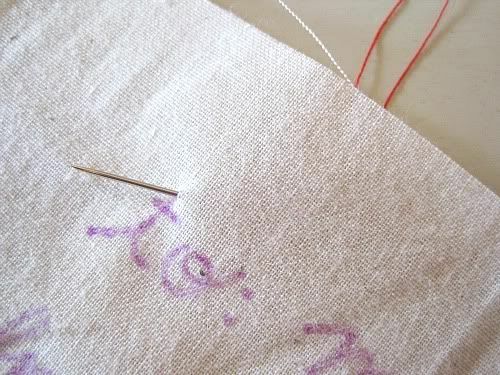 Bring your needle down just a small ways in front of where you came up and pull gently, leaving a small loop on the back of your fabric. 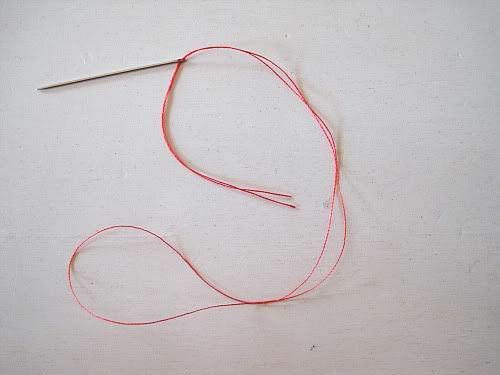 Put your needle through the loop and pull tight. Now we start the embroidery back stitch. 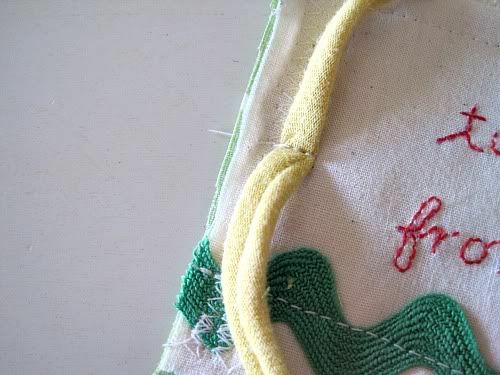 Here is my favorite basic embroidery tutorial from Purl Bee, if you're not familiar with the backstitch. 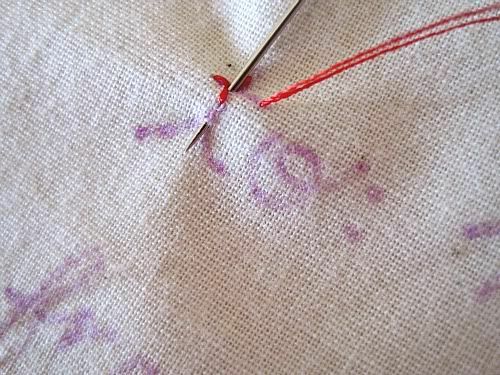 Bring your needle up a small ways away from the end of your last stitch, and then down into the same hole of that last stitch. 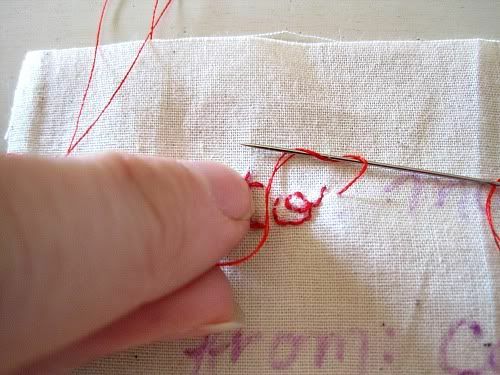 Pull your thread tightly as you bring your needle up in the next spot, and then down into the hole of the last stitch. Continue this pattern, following the lines of each letter. 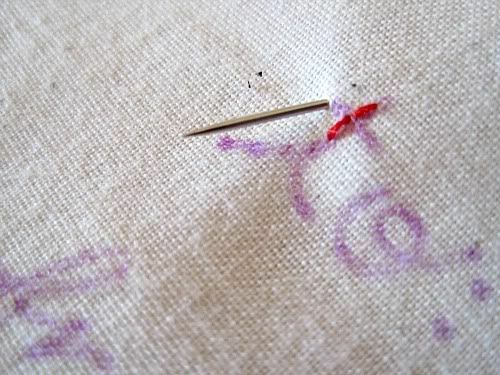 You're going to use a french knot on the colon. Again, refer here if you need help. 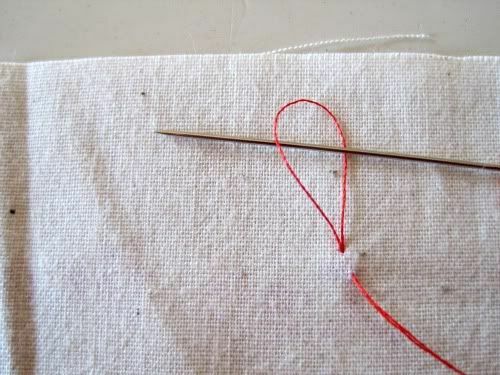 Bring your needle up right on the dot and wrap your thread around your needle two times. 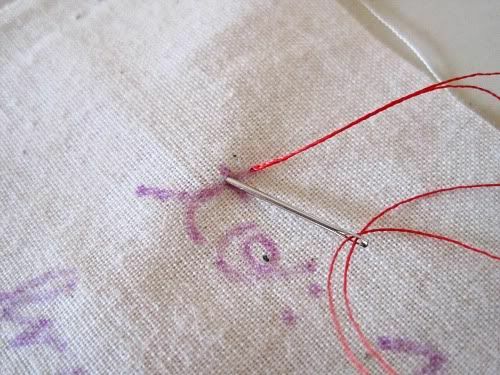 Pull your thread tight around your needle as you put it back down through the same hole you came up in. Pull your thread tight in the back. There it is. 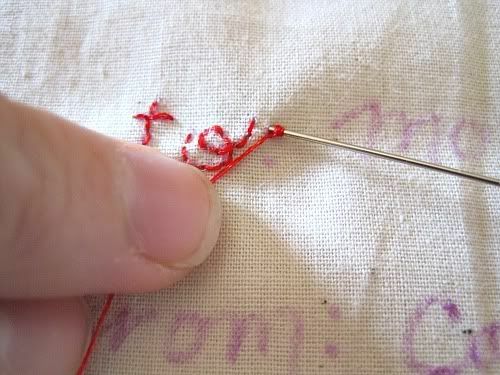 Continue to backstitch until you get to the end of one sentence, or run out of thread. 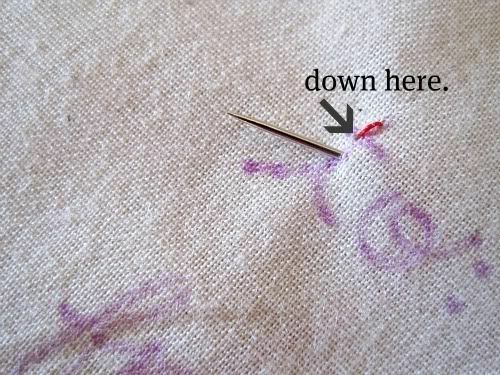 Don't try to bring your thread across from the end of one line to the beginning of the next or you'll be able to see the thread underneath your fabric when it's all done. It doesn't look nice. Tie the end of your thread around the back of a couple stitches nice and tight and cut your thread leaving a 1/4" end. 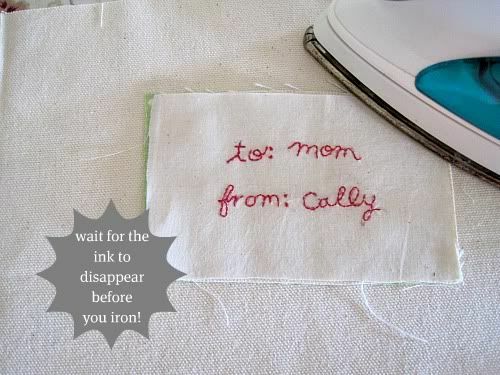 Once your ink has disappeared, press your stitches with a hot iron. Your ink will set if you don't wait, so be patient. Sometimes I have a marker that won't disappear, so I'm careful to keep my stitches on the marks the best I can to hide them. Once you do this enough, you won't even need the marker. 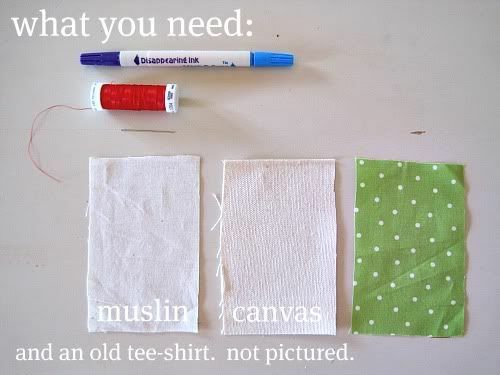 Now layer your three pieces of fabric, with the canvas (or thick material of your choosing) in the middle, adding whatever embellishments you like. 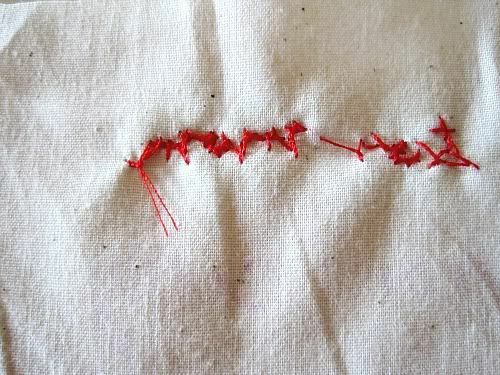 Stitch around the edges randomly and pull any loose threads to make the edges fray a bit. 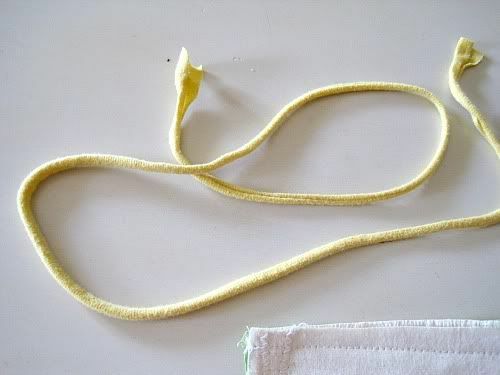 Cut any extra loose threads. For the tie I cut a long strip of an old tee shirt I had in the recycle pile. 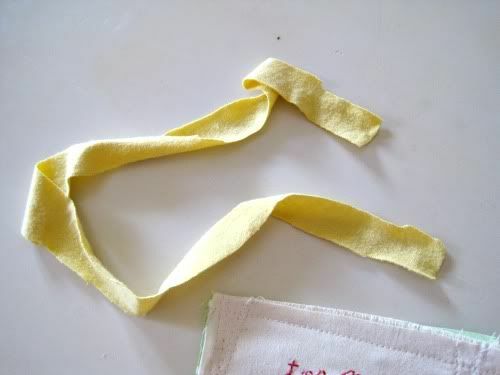 Do a quick stitch with your machine in the center of your tag to attach your tee shirt tie. And there it is. awesome. Cally, this is awesome! 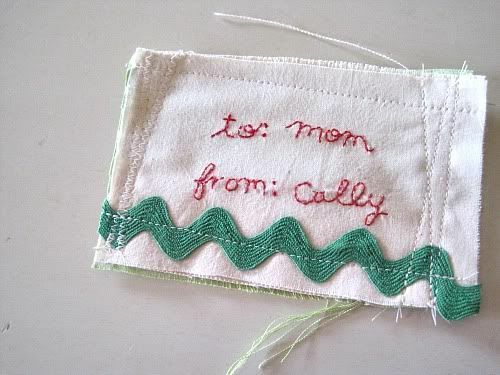 Please stop by Cally's blog. I promise you'll be there for a while. You can't miss my favorite headband tutorial, the stop motion Go-Go movie she made with her boys, or just bit and pieces of her. I love these. Now if I just didn't have to sleep, they would be on every gift I give this year. I'll hold out hope that I can try a few! I love these! If your child writes the script, it is also a nice way to preserve their handwriting/printing at a certain period of time. I had no idea how to do a knotless knot so I thank you for that as well. I will definitely add these to my project list. cally is the master. and even better she is so down to earth and honest. i love her. and she inspires me to try and be crafty once in a while. and i am not crafty. i've been on her blog for about 5 mins, i almost cried (cancer story) and cracked up (kids halloween costumes). it's so awesome that people share their life, better than a movie sometimes. i love this look but have never attempted it. thanks for making it look easy. i think i will try!! Love this idea! So sweet and simple! 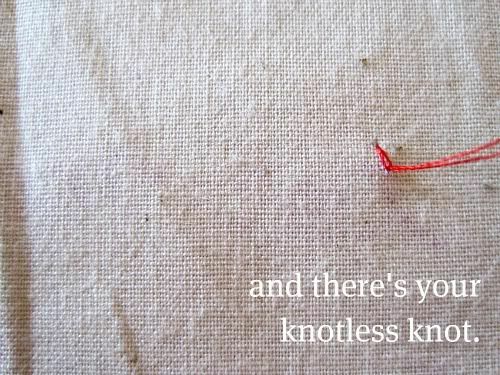 a "knotless knot"?!? who knew. great tutorial!